Ur, 1830 BC is a game about irrigation in Mesopotamia. It is based lightly on Francis Tresham’s succesful series of 18XX train games, of which 1830 and 1835 are the most famous. As this series is the favourite non-Splotter game of three of Splotter's designers, we wanted to make a contribution to this great gaming tradition. So here it is! Ur has a lot of different dimensions. 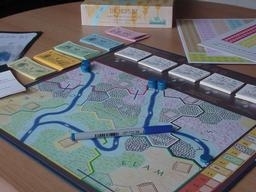 It's a game about water networks and strategic planning; it's a game about land speculation and knowing when to move to greener pastures; it's a game about managing the resources of large estates; and it's a game of tactically outsmarting your opponents to get that last drop of water away from his land onto yours. It has the feel of an 1830 variant, but is vastly different especially on the board. Each player in Ur controls a dynasty in ancient Mesopotamia. The game is played in rounds consisting of three phases. In the settlement phase, players buy and sell land, trying to settle the areas that will yield most. If the population in an area grows large enough, states emerge. These states can build irrigation works in the land development phase. After that, the rainy season starts: water comes down the river and is diverted to be used for irrigation. Each plot of irrigated land yields income to the land owners and to the state that operates the waterworks. As more and more states are founded, the technological development in waterworks and digging tools drives old equipment out of use. Canals are built faster and faster, land yield goes up, and more and more land becomes available for agriculture. The game involves three levels of strategy: first, smart buying and selling on the land market; second, tactical play developing the right land and canals on the map; and third, strategic anticipation and control of the speed of technical development. The playing material consists of a game board, wooden discs that represent the water, a number of coloured counters to represent land ownership and waterworks, a deck of cards and a set of Splotter banknotes. Question: What does it mean that a river area lies in a particular state? Answer: Nothing. River areas are effectively neutral. Question: In the settlement phase, can I buy one piece of land each turn, or only one piece of land in the entire phase? Answer: You may buy land multiple times in a phase, but at most one piece per turn. That is: on your turn, you may either sell&buy or bid for primogeniture. You may buy only one piece of land, and sell as many as you want. Then, it's the next player's turn. In your next turn, you may again sell&buy or bid for primogeniture, and so on, until everyone passes. So it's just as in 1830, except that there's no yellow/orange/whatever color zone where you can buy more than one share in the same turn. Question: How many selling actions are allowed in one turn? Is it possible to force the price down by more than three boxes, using multiple selling actions? Answer: You can sell as many batches as you want. The maximum decrease in price holds for each action, not for each turn. For example, if you want to sell five hill areas, you may do that in one selling action: that will make the price of hills drop by three steps (the maximum decrease per action). Alternatively, you may sell the lands in two actions, for example, first sell three of them, then sell the remaining two. In that case, you get the current sale price for the first three lands sold, then the price drops by three steps, you get the new price for the remaining two lands, and then the price drops by two more steps. Thus the price will have dropped by five steps in total. Question: Is it true that digging crews can build canals everywhere on the board? Answer: Yes, that is right. They may even build canals in other states' territory. Question: Where should/may a reservoir on a river area with a confluence be placed? Answer: Always downstream of the confluence. Question: Is it possible for a pump to irrigate a piece of land that contains another pump? Answer: No. If a pump brings water to a field containing another pump, the latter will irrigate the field (if it is owned by a player). Question: Is it possible to pump water across a tile without irrigating it? Answer: Yes, that is possible. For example, if there is a canal from tile A to tile B and from tile B to tile C, with a 2-pump on tile A, then the pump can bring water to tile C without irrigating tile B. Tile B does not need to be owned by a player; only if you want to irrigate tile B, it must have an owner. Question: What happens to the money you pay for an independent nation in the beginning of the game? Answer: That goes into the bank (except for the money paid for the First Akkadians). Question: What are you allowed to do with the land of independent nations, before they are assimilated or traded in? Answer: Nothing at all. You are not allowed to build pumps or dig canals there, and you are not allowed to buy the land, even if you own the independent nation containing the land. Selling the land is allowed (however, since buying is not allowed, this is only relevant for the First Akkadians' land). Question: Does possession of an independent nation counts towards land ownership in a state? For example, if I have got Eridu, while all other tiles in Sumer are owned by other players, am I entitled to a 1/11 share of the harvest? Answer: No. Owning an independent nation and owning the land is not the same thing, and in fact, you can own either the nation or the land, but not both. As long as the independent nation is controlled by a player, nobody owns its land. The only exception is the First Akkadians' territory. These fields can be owned by a player, while the First Akkadians as an independent nation are owned by a player as well. Question: What happens to the independent nations that are traded in for their special abilities? Answer: They are gone for the rest of the game. Question: Can an independent nation which has been assimilated be sold again? Answer: Yes, but it can only be sold to another state, not to a player. Question: What happens if you exchange Der for a forest land? Does the state containing the forest land get any money for this? Or does it assimilate Der? Answer: No money goes into the state treasury. Der disappears. The state is not compensated in any way. Question: Is it allowed to trade in Der for a forest city instead of a normal forest land? Question: Eridu may dig only after it has been assimilated by a state, right? Answer: No! Eridu can always dig canals! If Eridu has been assimilated by a state, the king of that state decides where Eridu will dig. If Eridu has not been assimilated yet, the player owning Eridu decides where to dig. Question: Do you have to trade in Eridu if you use it to dig a canal, or can you use it every round again? Answer: Eridu can be used again each round: it does not need to be traded in. Question: Suppose I am king of a state and I also have Eridu. Is this state still required to hire a digging crew, when it becomes active? Answer: Yes. You can avoid this only by having the state assimilate Eridu. This is possible only in the third era. Question: Suppose Akkad becomes active in the third era. In its first turn, it does not hire a digging crew, but assimilates Eridu instead. Do the First Akkadians disappear? Answer: No, they do not disappear. The First Akkadians do not disappear until Akkad hires a real digging crew (or the fourth era starts). Note that this construction is possible only in the third era. In each other era, Eridu cannot be assimilated, and Akkad would need to hire a normal digging crew. The Great Zimbabwe D'r Af Indonesia Naar de Oost!